J D Gabani Commerce College And Shree Swami Atmanand Saraswati College of management, Surat is affiliated to Veer Narmad South Gujarat University, Surat and manages by Shree Tapi Brahmcharyashram Sabha Trust, Surat. 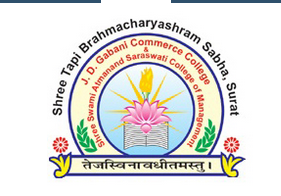 J D Gabani Commerce College And Shree Swami Atmanand Saraswati College of management, Surat was established in 1999. J D Gabani Commerce College And Shree Swami Atmanand Saraswati College of management, Surat offers various graduate courses as well as Post Graduate courses. J D Gabani Commerce College And Shree Swami Atmanand Saraswati College of management, Surat is affiliated to Veer Narmad South Gujarat University, Surat. List of facilities available at J D Gabani Commerce College And Shree Swami Atmanand Saraswati College of management, Surat for students. This page was last modified on 28 July 2015 at 11:07.